When we started from Munnar on sunny but cool morning for Thekkady, Periyar, Kumarakom. We were staying in tea garden area, so route we have chosen for Thekkady didn’t pass through the town of Munnar. We started from our hotel in tea garden area and driving through spice plantation. There was Cardamom plantation on the slopes, then I had seen Black pepper plants/vines on both sides of roads and other spices trees. There were small & big houses with some or other spice plants outside the houses. All along the road, everywhere I had seen Black Pepper or cardamom or cinnamon or cocoa plants/trees. We crossed the villages and then stopped at one spice plantation. I paid for ticket & guide. The girl guide was sweet and eager to explain me about all the plants in the farm. It was like a live museum, where they had planted 2-5 plants or trees of all the spices grow in that area. After showing me around, she took me to a tree house. It was not a real tree house, it was more like a lookout point with some sitting arrangements. After spice garden tour we bought some spices which were much better in fragrance & taste than what we usually get in Delhi. When started from Munnar, the road was full of turn & twist with the steep downhill at some places. Then it crossed from some forest kind of is and vegetation kept on changing all along. As we moved more towards Thekkady the weather got much warmer and humid. We reached in 4.5 hours even after stopping on the way. 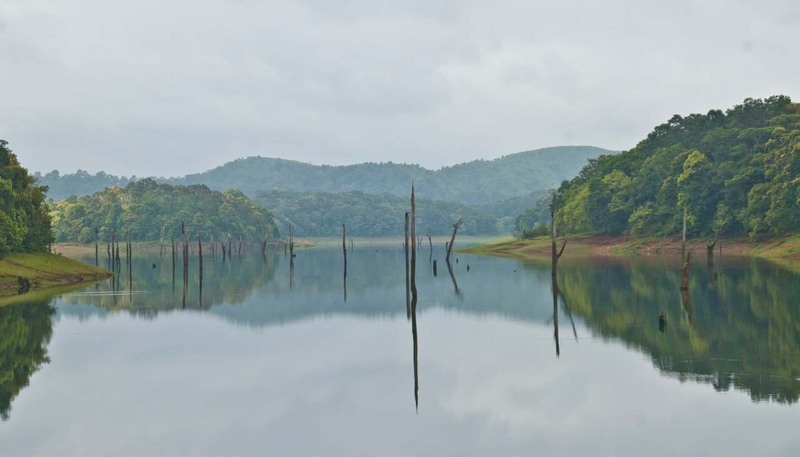 In Thekkady we stayed inside the Periyar Tiger Reserve. It was peaceful but the only disadvantage was the curfew hours i.e. you can’t enter after the reserve after 7.30 PM, in case if you go for some program outside the reserve area then you need to inform the concerned authorities well in advance and carry the permission with you. But we decided to come back before restricted time. After check in we went to town for lunch. There we have seen lots of massage places. This area of Kerala is considered to be best for Ayurvedic massage treatments, mainly due to its climate. In town, there was not much except for massage places or Ayurveda clinics or spice shops. We found a very nice tea and snacks shop, here we enjoyed good Kerala style tea. Later on, we went to Elephant Junction for Safari. I bought tickets for myself and my parents opted out for it. I was expecting that they have some kind of “hawdah” to sit on the elephant but there was none….. I have to sit on an elephant like we sit on horse :-O . I got on the elephant through a platform, specially design for getting on top of the elephant. The Mahout (Elephant trainer) took me through the spice plantation. All along he was giving instructions to Elephants in Malayalam and animal was following instructed. He took my camera and instructed elephant to pose (Ha ha…. yes…. to lift his trunk or move left right) and clicked some very interesting pics of mine. It was a fun tour but at the same time a bit scary also because sitting on the elephant that way was somewhat tiring also and I was scared to falling down 🙂 In between a snake also crossed our path and elephant got a bit agitated but Mahaut controlled him well. Finally, after roaming around in plantation for 40-45 minutes, I got down from elephant feeling thrilled. It was getting dark so we returned back. Our resort surrounded by thick forestation and there were black languors on trees, their cry/noise & jumping between trees gave us feeling of living in the jungle. I tried my hand at badminton court for a while. I decided to do boat ride next morning in Periyar lake. Since we were staying near to the lake and it was 15 minutes walk to the ferry. It was a slow paced ride, they kept the boat in the middle of the lake and we have seen some animals grazing on shore. There were some birds also flying or sitting on the wooden branches inside the lake. We came back to resort and later we went down to the Periyar river flowing behind resort but we came back quickly because there were leeches in grass & they can stick to us if we were not careful. Before noon we started for Kumarakom. It took us around 4 hours to reach. On the way, we have seen a temple in Kumarakom town and then a fossil museum before coming to our resort. Our resort was next to the backwaters and they have small canals running inside the resort. The place was calm and lush green. We stayed in a cottage by the canal, they have some cottages on top of canals also. They had made cottages on plinths, which were one floor high from ground to avoid flooding if water level increases. Though the place was peaceful and full of greenery, but due to this, there were lots of mosquitoes. Thankfully I have a habit of carrying mosquito spray, so it was ok for us. We had decided to do nothing and just relax as we were traveling for last few days. We started from Guruvayur & Cochin then went Munnar and Thekaddy. To get the feel of backwaters, I went for a boat ride. Later in the evening we relaxed by infinity swimming pool next backwater and seen the sunset in backwaters. As our resort was little out of town so, we decided to have dinner here instead of going out and exploring. The restaurant is made on backwater (Also on plinths). Access to it is through metallic grill and water was running under it, really interesting. It feels as you are walking and sitting on the water. Next day morning, we went to Bird sanctuary but as vegetation was very dense so though we spotted some birds but I could not get nice pics. Thekkady, Periyar, Kumarakom are small towns of Kerala but are very popular among tourist due to the natural beauty and ayurvedic treatments. After breakfast, we started for Trivandrum and Kovalam. Seems to be peaceful place. The cardamom plantation reminds me of the spice farm I visited in Belize! Very cool. how beautiful! love all your photos too 🙂 Elephants are beautiful creatures! Wow, Kerala looks like a beautiful place to visit! Your photos are really great too! Kerala is a beautiful place with nature’s bounty. This place looks fantastic. Compelling read and great pictures. Yes, we have cacao tree in Kerala and some other parts of India. India is amazing we have sea beaches, mountains with snow, deserts, forests, waterfalls and list goes on and on. Pics are so beautiful Sapna. i have not explored much of Kerala. now i think I should plan a visit soon. Thanks. You should visit Munnar whenever you get a chance, it is peaceful and beautiful. Love your pictures! The one with the water reflecting the sun in the sky is particularly spectacular! Also, how cool is it that you got to ride an elephant!? 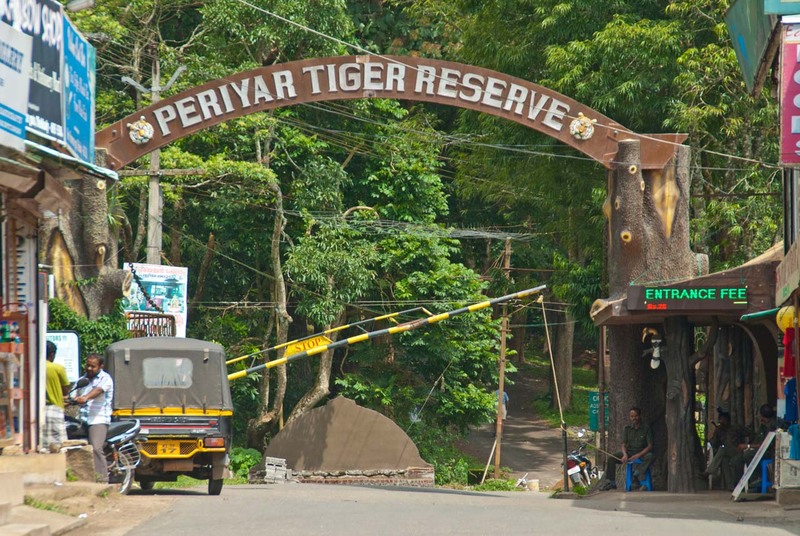 Although, it is a little peculiar that they had curfew hours for the Periyar Tiger Reserve. I wonder what the reasoning was for that? Thanks a lot. The elephant was ride was in spice garden and quite thrilling. The curfew is due to the location of the resort, it is in the forest area. Sometimes during night time, wild animals cross from one place to another in the jungle and they are close to the resort area. So to protect them from human encounter this curfew timing. Nice narration.The place look peaceful the photos enhances the beauty of the elephants.